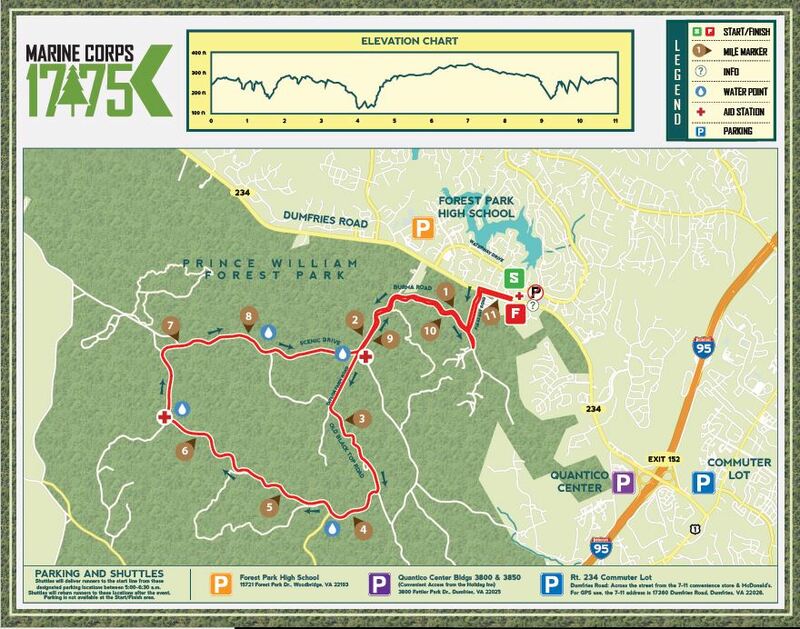 On Saturday, March 23, 2019, PWCARES supported the Marine Corps Marathon Program Office with the annual 17.75K run through the Prince William County Forest. Thanks to all who came out to support the event. 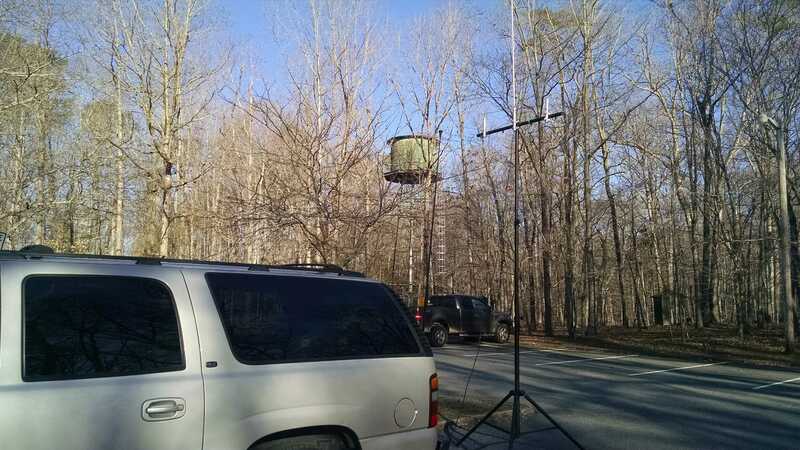 Despite the wind, the antenna at Start/Stop stayed up, thanks to proper guying by Tom, W4PIO. The 6m frequency worked for communications among those that had it. Oddly, 2m communications did not work. Whether that can be attributed to a geomagnetic storm that rolled through Friday into Saturday, or something else, we are not sure. As the sun came up the communications improved. 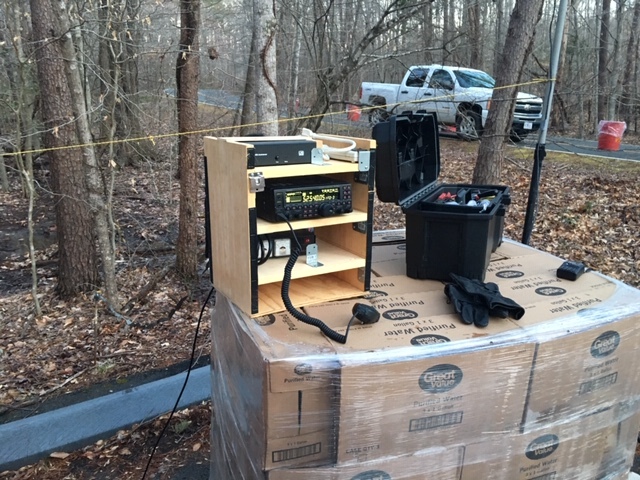 In one case, David, KG4GIY and Tom, W4PIO were standing almost next to each other and one could hear the communications and one could not, and there was no predictability about who heard what, when. Despite 6m working, it is not conducive to those that have to walk a bit to be able to see all of their section, making it a less than optimum solution. Several folks forgot their access passes. Thanks to Brian, WC4J (top photo) and Eric, KJ4MSW (bottom photo). Christmas is behind us, and New Year’s Day is right around the corner, but in the meantime, you probably have a few hours to kill. How about doing some training? EOC–101 Operation in the PWC EOC. G–191 Incident Command System/Emergency Operations Center Interface. G–775 EOC Management and Operations. There are also some new optional course that you can take if you have some spare time. Remember, if you already have one of these courses, you do not currently have to retake them. So if you have IS-700a, (the current version is 700b), you are covered. As always, please send the Emergency Coordinator a copy of your certificate for those classes that you passed. See you at the January Training! (Saturday, January 19, 2019) at the EOC. Welcome to September. Fall is here (or at least just around the corner). Hurricane season is well underway. And it is time to check our supplies for winter. I had an interesting conversation with some of my friends about being prepared. One topic that we kept coming back to was the lack of preparedness we were all suffering from. The great ramp up, concerning visibility, that came from September 11, 2001, has virtually disappeared here on the Eastern Seaboard. Even those who as recently as 2012 (Sandy) have just fallen out of the habit of being prepared. And there are many reasons. Even my own state of supplies is out of date and in need of replacement in many cases. Following September 11, many people spent a lot of money on emergency supplies, spent time on preparing plans, and spent time getting ready. The problem is that it is not a one-time thing. If you do not practice, or worse, do not have a need to practice, then your preparations get stale quickly. You end up shrugging your shoulders. I’m as ready as I can be. And then you forget. Or wonder what all the hype was about. If you do not live in a storm zone, it is all too easy to get lulled into a sense of security. Until the next unimaginable thing happens. I get it. I talk about preparedness almost every day to people, and I am woefully unprepared myself. What can you do? There are many things. You can join your local CERT team. There they will help keep the idea in the front of your mind to exercise you plan. If you are part of ARES, you should be reviewing your plan regularly. Make it part of your monthly check-up, along with your finances. Get a Red Cross CPR certification. They expire every year, and that will force you to reevaluate your situation. At the very least, take a look at your last plan, evaluate where it was when you finished it and updated it. Phone numbers, medicines, contacts, documents, then go through your go-kits and refresh all the things that need refreshing. Remember, clothes shrink in bags stored in cupboards. There are many good ideas for preparing for an emergency on the ARES website. Take a moment and see how prepared you are. Are you using the right forms? The more things change, the more they stay the same. That is the loose translation of a classic French saying about the nature of change. And like most changes, we are often not aware of them unless someone says something. Take government forms. They are constantly changing and evolving, but unless you need them, or use them regularly, or are part of the committee that is responsible for updating them, you hardly ever notice. The Federal Emergency Management Agency (FEMA) is responsible for maintaining the National Incident Management Forms. Most of the forms post-September 11 came out of the fire service or the Hazmat response teams associated with the Coast Guard. They worked, but they were never optimal as far as most people were concerned. FEMA promised new forms. Most of us just carried on. In 2015, they updated the NIMS ICS Forms. All members of PWCARES should download the new Forms book (also available on our ICS page) and use those forms instead of any prior forms. Please take a moment to update your go-kits. Our own Bill, K5AE, answers the question – do Tiger Tails work? He has put together this video with a lot of excellent supporting research and background material. Please comment directly on his page.